A blog of the past, present, and future happenings of a certain Hannah E. Pearsall. A girl for whom just knowing isn't enough. Do not fear being yourself. The person that you are is unique and entirely worthy of the best in life. Only you hold the ultimate power to shape your life into the form that you want to grow from. If you bear witness to someone being bullied or an event you know is in need of guidance or assistance, do not be a bystander. Take action. Not only will stepping up boost your confidence but it will also greatly impact the person that you helped. Contrary to popular belief, everyone makes mistakes (even teachers. My apologies, Mrs. Hebert!). Do not let the fear of looking wrong prevent you from truly learning material in the classroom or outside of it. The ability to question is human nature, it allows us to formulate individual thoughts and reason with ideas. Take risks and do not dread fear. You can never learn something new if you don't try it. Perhaps the class or speech you have regretted signing up for will benefit you twice over, more than anything else ever could. Without rejection, one would never experience the euphoria of acceptance. Without searing pain, one could never truly grasp the sanctity of contentment. With this said, it is up to you to determine how to use these tidbits of guidance. I wish you all the best in your future endeavors. In summation, pride can take two tracks: that of public pride or that of personal pride. In this sense pride can be good or bad, depending on the character of the person who is experiencing it. As long as pride never morphs into hubris, it will remain a positive aspect of a person. Over my high school career, I have developed a pride in the person I have become and, similarly, in the subjects that have made me who I am. The following paragraphs below highlight the items of which I am most proud. Academia has always been a large part of my life. I am an accomplished student and will be graduating with high honors being ranked fourth in my class. Although learning does come easily for me, I have had to work for my grades. Instead of mingling with friends, I could be found staying up late to study or putting in extra hours to make my class project pertinent and enjoyable. Through this diligent effort, I learned much about the world around me, scientifically, analytically, and metaphysically. Social gatherings allow bonds between people to grow but education allows the mind and body to flourish. In banishing ignorance and completely immersing oneself in a work of literature or connecting to ancient history, one is able to form themselves into anything. My academic achievement has fostered a love for all cultures within me, a love that can only be quenched by travel. I've never had the opportunity to venture outside of the United States, until now. This summer, the year of 2014, I will make a great leap across "the pond" to explore Ireland with Michigan State University's Freshman Seminar Abroad program. Without my pride in academics, I would never have developed the affinity for life and the practices of those around me. 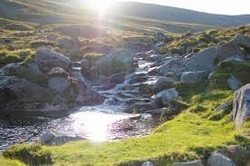 Here is a photo of Wicklow National Park in Ireland, a place I hope to visit on my journey. My equestrian accomplishments hold much pride for me as well. I have competed and won awards for horse judging, knowledge, and riding skills. Though these tangible accolades are meaningful, it is the techniques and skills that have been achieved that hold most value. It has taken about 10 years to develop riding muscle, everyday know-how, and come across experiences that reading a book could never provide. Of course, what I have learned is only a mere fraction of the unbounded insight of the equine world. I am dedicated to spending the rest of my life consuming more and more knowledge on this subject. I am also proud of my empathy towards others and an ability to understand people for who they are. Though this statement may seem presumptuous, it cannot be further away from that idea. It seems I have an uncanny back to connect with the plight and misfortunes of others and feel a pain somewhat similar to their own. This quality, most unfortunate when watching movies such as Schindler's List or reading books like Marley and Me, allows me an opportunity to appreciate all people for who they are instead of formulating preemptive judgments of how they appear physically. The piece linked below is a dialogue poem I authored based on the sufferings of the Native Americans. If so inclined, feel free to take a quick read over. Remember, pride is an admirable quality when practiced in moderation. Do not be afraid to emphasize the qualities that make you the person you are. As of the date indefinately perched beneath this blog post title, there are merely eight days remaining of my high school career. My first reaction to this fact is exuberant anticipation for the new journeys that will be open to me once I graduate. My second reaction has taken the form of a melancholy wave, washing over my psyche as all the experiences I've had at Laingsburg High School resurface. I am a perfectionist. This, however, is a blessed suffering. In particular, this character trait aids me in obtaining high grades but also results in countless hours of stress. If I were ever to leave an assignment blank before bed, my mind would run until I finally removed myself from the sheets only to grab a pencil and complete what was left unfinished. I am consumed by the ideals representative of the 1950's. I came to this realization through my somewhat unnatural obsession with big band sound along with reading Brave New World by Aldous Huxley. I admire chivalry, the sanctity of marriage, and value the significance of an intelligent conversation. I would much rather talk to a person face to face instead of making one small movement to click the "send" button on my cell phone. I find the smell of the earth after a summer rain more stimulating than the most current video game released for the Xbox360. Huxley tactfully exposed the perversity of our current consumeristic society in his futuristic novel, a future that is all to real. I have a love for the eccentricities of life. The most intriguing aspect of our beautiful planet, to me, is that something seemingly simple is equally complex. A single drop of water is composed of millions of atoms of hydrogen and oxygen slipping and sliding past each other to find their place. A singular tree is an ecosystem to thousands of creatures, plants, and insects. Humans are no different. Each person you come across has they own story, their own set of morals, and their own experiences that makes them unique. I am an animal enthusiast. I will be attending Michigan State University next fall to major in pre-veterinary studies. Yes, this I may have known before I entered high school but it is a quality that truly makes me the person that I am. I believe that animals have feelings, just as people do. I can say that I have experienced this first hand with my horse, Sonny. Looking into his eyes, I can tell if he is having a good day or bad, I can sense if he is in pain or is bursting with energy. Knowing this made him human to me. Through my parent's divorce and many other personal foes I've been posed against, my equine counterpart was always there to hold me upright. He was the family that I was missing, he was the friend I did not possess, he was the sounding board I needed to keep me level. That bond, the bond between animal and human, is so bare and raw and innate. It is a connection that is so pure words are too tainted to being to describe how it feels. Here is one of my senior photos with the love of my life, my best friend, and my confidante; Sonnys Golden Guy. I am a drum major. Drum major was not merely a position for me, it became a philosophy to live by. Becoming a better marcher transformed in to a dedication to excellence, aiding the lower classmen in musicianship and marching technique translated into helping those in need, leading the band members became standing up for what is right and making just decisions. Band has taught me more than just how to play an instrument or march from yard line to yard line; it has given me a template from which I can build a successful life. Each of these ideals an qualities have molded me into the graduate that is typing this for you to read today. This is a snapshot of my first year as Head Drum Major, the time everything changed for me. The LHS concert band recently performed this tune as a send off to all the senior members. Though the Italian lyrics depict a love song, a singular line stands out: "When I'm alone I dream of the horizon and words fail me."